How did this year’s rookie class match up against previous years in terms of fantasy football production? 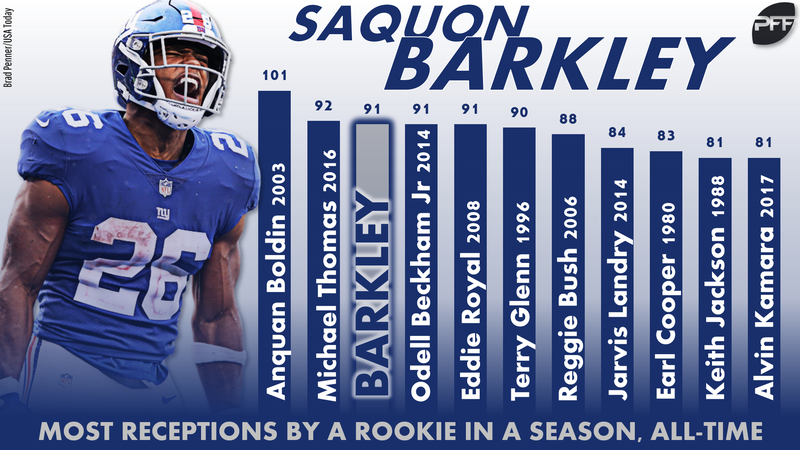 Saquon Barkley was hyped up in a big way, but how did his 2018 campaign compare to every other high-touted rookies from previous season? This article will take a look through every rookie from the PFF era (since 2007) and see how the 2018 class stacks up. Barkley was the best rookie running back for fantasy purposes since 2007. In fact, it wasn’t even close. His 24.0 points per game were by far the most among all rookie running backs who played at least 10 games. Barkely topped Ezekiel Elliott’s record, which was set just two years ago. We knew Barkley would be good, but he exceeded even the loftiest expectations with 1,307 rushing yards and 11 rushing scores to go along with 91 receptions (! ), 721 receiving yards, and four scores through the air. Yes, he had over 2,000 total yards and 15 touchdowns as a rookie. It was an overall strong season for rookie running backs. 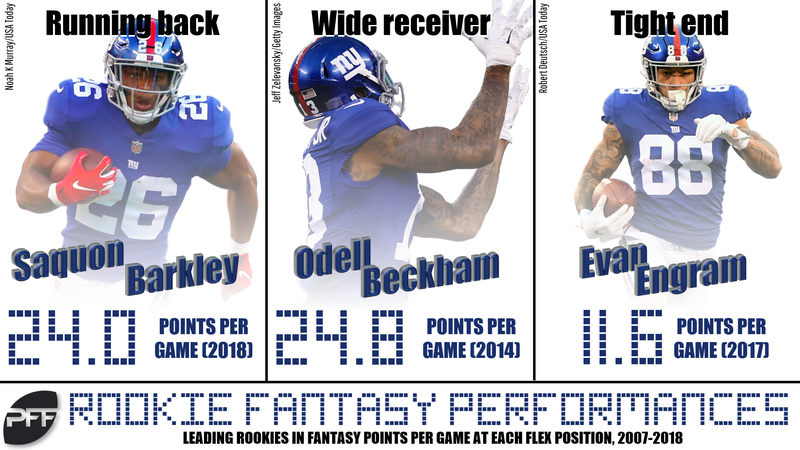 Three 2018 rookies — Barkley (24 PPG), Phillip Lindsay (14.9), and Kerryon Johnson (14.1) — made it to the top 21 in rookie running back fantasy PPG. This marks the second straight year that rookie running backs were big in fantasy; the 2017 class has five members in the top 20. Nick Chubb (12.2), Sony Michel (10.9), and Nyheim Hines (10.1) also averaged in the double-digits, giving the 2018 rookie running back class six solid fantasy performers. Others, like Gus Edwards, really game on down the stretch, too. First — holy smokes, the Giants have had some wildly good rookies in the last five years. 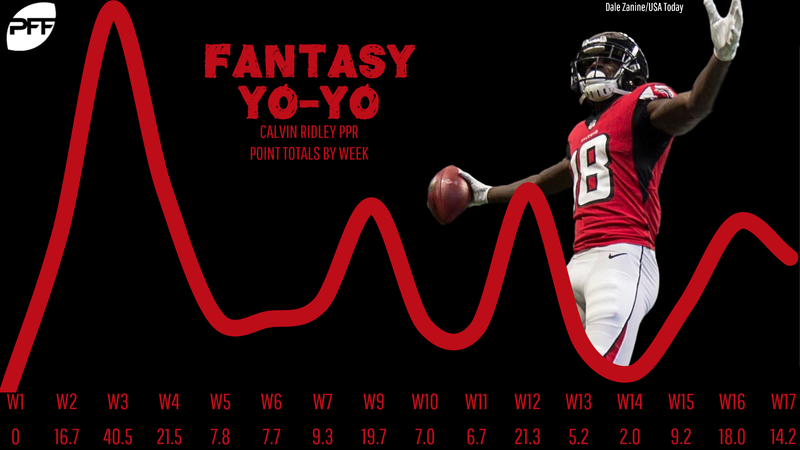 Keeping the focus on the 2018 class, though, only Calvin Ridley cracked the top 20 rookie receiver performances with 13.0 fantasy PPG. He ranks 12th. Ridley had some massive, week-winning games as a rookie. He dropped 7-146-3 in just his third-ever game and followed it up with a 4-54-2 line the following week. That Week 3 game was his only 100-yard receiving effort of the season, but he did top 90 yards (with a score) in two other games. While no other rookie cracked the top 20 in the PFF era, Christian Kirk (10.3) and D.J. Moore (10.1) averaged double-digit fantasy points. Dante Pettis (9.4) had several strong weeks as San Francisco’s No. 1 and looks promising with Jimmy Garoppolo returning next season. Courtland Sutton (8.5) failed to step up when given No. 1 duties, but he was overall decent with room to grow. Michael Gallup will surely be one of the most talked-about sophomore wideouts leading into 2019, but his 6.0 PPG ranked 11th among this year’s rookies. Herndon caught 39 balls for 502 yards, giving him a healthy 12.9 yards per reception. With Sam Darnold entering Year 2, Herndon is definitely a name to watch. Andrews emerged as Baltimore’s best tight end over the second half of the season, and he also has big-play ability with at least one reception of at least 17 yards in six of Lamar Jackson’s seven regular-season starts. The athletic tight end can take a big step forward next year. 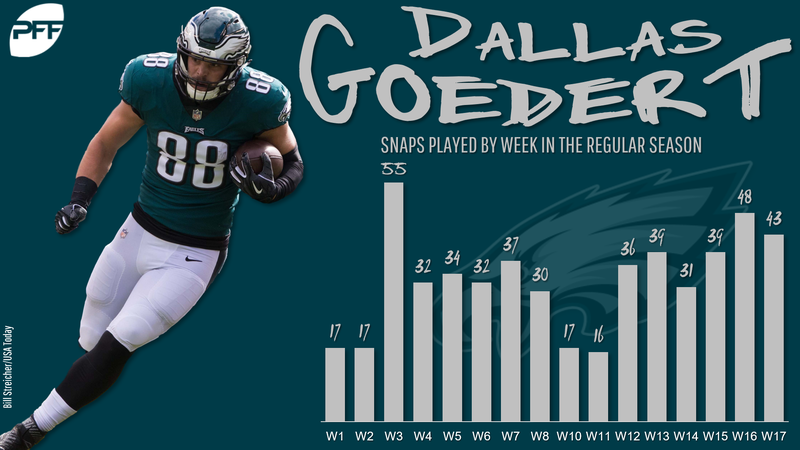 Dallas Goedert saw his usage in Philadelphia increase down the stretch, but Zach Ertz is coming off a NFL record-setting performance in terms of target volume, so Goedert’s path to fantasy-relevant playing time remains cloudy. Ian Thomas, meanwhile, will become very interesting should Greg Olsen decide to hang them up. Thomas averaged 6.4 targets, 5 receptions, 49.2 receiving yards and 0.4 touchdowns per game over the final five games with Olsen sidelined.